The 31 metre Turkish gulet sailing yacht Altair, listed for sale by Charles Jones at Yachting Partners International, has had a €150,000 price reduction. Originally built in wood as a passenger yacht by Turkish yard Viking Yat to a design by Haluk Kaya and launched in 1992, Altair was fully refitted as a luxury private yacht in 2012. A second major refit in 2017 saw her interiors upgraded to modern superyacht standards and she now accommodates 12 guests in six double cabins, all with entertainment centres and en suite bathroom facilities. Aimed squarely at the charter market, Altair has a large air-conditioned saloon with comfortable seating and an entertainment centre including a large screen television set. On board highlights on this yacht for sale include a shaded aft deck with a solar system light feature, an enclosed flybridge pilothouse with 360-degree views and two sundecks with sun loungers. During her latest refit, she gained new technology and new sails, transforming her into a sailing yacht capable of achieving up to nine knots in 25 knot winds. She also boasts two masts of 22 and 18 metres, four manually winched furling system sails and new heavy duty shrouds and ropes. Under power, twin 193hp MTU diesel engines allow a cruising speed of eight knots, topping out at 13 knots. 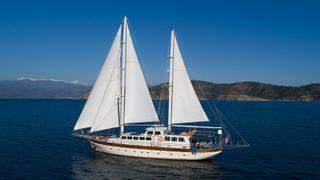 Lying in Turkey, Altair is now asking €650,000.